Once again the Birmingham Catholic Primary Partnership has been active in Rwanda on behalf of the children and school communities that have contributed so generously to our on-going appeal. Through the work of Sister Susan and the Sisters of St Mary of Namur we have been able to support a variety of projects that make a significant difference to the lives of those in Rwanda and who are so grateful for the help support and prayers you provide. In this update we have tried to highlight some of the ways your donations have made a significant contribution to improving both the quality of life for people in Rwanda in the short term and how we are supporting them in becoming proud, independent and productive members of society in the long term. Sister Susan, the Sisters of St Mary of Namur, the people of Rwanda and the BCPP Management Board thank you so much for your continued help and support. 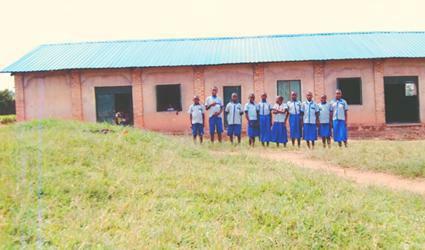 A good basic standard of education for all is becoming a major political priority in Rwanda. The President of the country recently recognised that too many children were lacking the basic educational skills needed and as a result crime and drug related crime was increasing. It had been identified that the most significant drop-out rates occurred was in Primary Years 1 and 2. Schools were asked to identify all children who had ceased their education at this time and investigators were asked to identify why this was happening. It was decided that schools needed to locate children over the last five years who didn’t complete their education and return them to school. If they did not return then the person or institution deemed responsible would be held accountable and prosecuted accordingly. Kiruhuru Primary School had identified that in the last five years one hundred pupils had left full-time schooling during that period. Sixty-eight children were located and re-started school, taking numbers in Kiruhuru primary to 1300 pupils. One significant consequence of this policy is that Primary 1 and 2 class sizes are not only in excess of sixty pupils but all span an age range of six years old to fourteen or fifteen. Thanks to the efforts of the children in our BCPP schools the children in Kiruhuru Primary School are very proud of their newly refurbished classroom block. 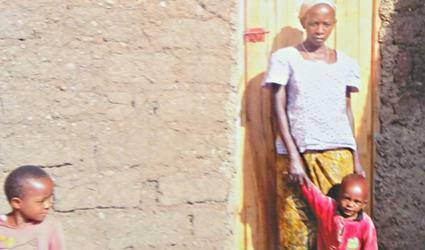 For Bouifride her need was a new roof, this she now has thanks to the fund-raising efforts of BCPP children. 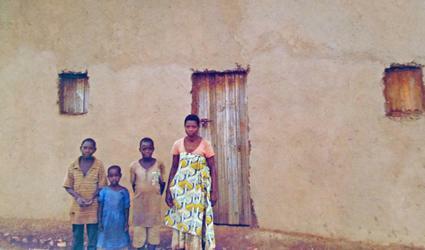 Alphousiue lives in this house that the funds raised by BCPP children helped to build last year. 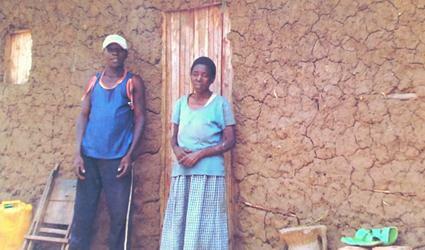 There was however a big problem; in the heavy rainy season the mud bricks were starting to be washed away. This year money raised by BCPP children has meant that we have been able to put a cement covering on two side of the house to protect it from the rain and make sure the house will last for a long time. 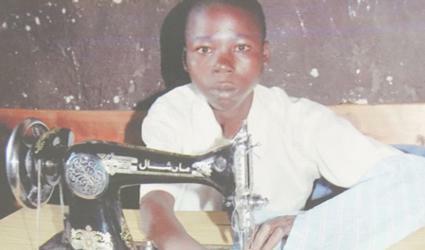 Olivier had to finish school because he became too ill and weak to return after severe stomach issues. Oliver came to help out at the school making uniforms and repairing clothes. He decided that he would like to do this so BCPP funds paid for a morning tailoring course, his internship and sewing machine which means now has a trade, is able to look after himself and can earn a living. Here is the house of Dancille Mukankuriro. 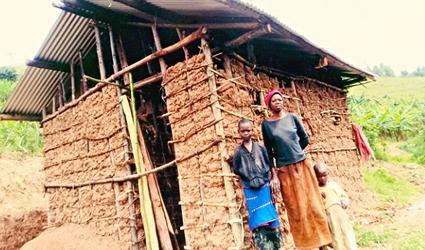 This is a house that has be built by money raised by children within the BCPP. Her house is now finished and she has her own front door. Dancille is now around thirty years old but as a child she was badly injured in the earlier genocide. This left her with severe head injuries. This is her first-ever house. Dancille’s little daughter has just started nursery class. To get to school each day means she has to walk for two hours in the morning and two hours in the evening to get home. Thanks to the support of children within BCPP Jean Claude’s life has been transformed. As a baby Jean Claude suffered with tuberculosis. A very painful and disabling disease. Jean Claude was abandoned by his mother and his father was unable to look after him. He was left simply lying on the floor. When he was four years old he was taken in and raised by another family. BCPP donations meant that Jean Claude was able to learn how to be a tailor – a course that lasted nine months, they then paid for his two-month internship which was needed to become qualified and then bought him his sewing machine. 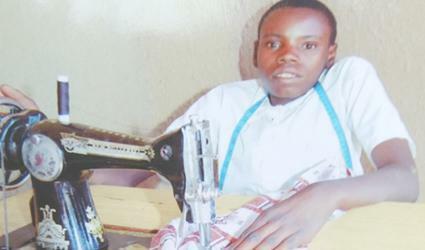 He now earns his living sewing, repairing and making school uniforms. Lauginda now lives in a house with a separate kitchen. Before the help BCPP children provided, she had to cook outside. She now has a small separate kitchen that has a slate roof so that the building will last much longer than a building with a metal roof.